If you have already signed up for the newsletter or would like to continue to the homepage, please select the close button. COCIC is an equal opportunity employer. No applicant shall be discriminated against on the basis of race, religion, color, age, gender, national origin, disability, or other criteria prohibited by the City, State or Federal law. COCIC announces the creation of the Central Ohio Community Land Trust today. COCIC, supported by the County Treasurer's Office and the Franklin County Commissioners, serves as the Franklin County Land Bank, and will oversee the Trust as its subsidiary. 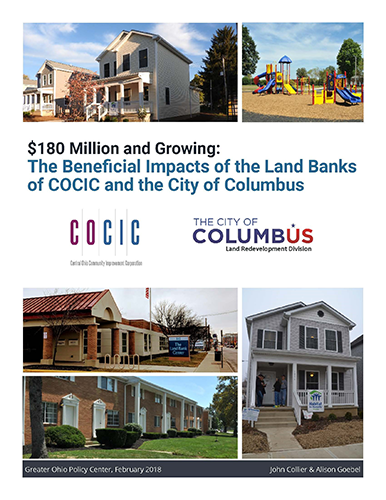 A new study by the Greater Ohio Policy Center revealed that COCIC and the City of Columbus land banks generated $180 million in economic impact across Franklin County over the past five years. The study points to preservation of property values, land sales, and activity in disinvested neighborhoods as key land bank functions positively impacting the economy. Interested in acquiring a COCIC property? The COCIC Franklin County Land Bank is a public authority dedicated to returning Franklin County’s vacant, abandoned and foreclosed properties to productive use. COCIC is committed to the elimination and prevention of hopelessly blighted, economically-stranded properties.